Despite rising costs in research and promotional spending, Chinese search giant Baidu reported net profit was up by over 24 percent in the first quarter on growing ad revenue made through its mobile services. 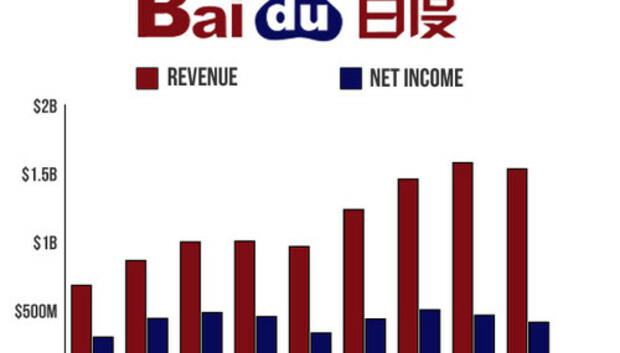 In the quarter ended March 31, Baidu's net profit reached 2.5 billion yuan (US$405 million). Revenue grew over 59 percent year-over-year to 9.5 billion yuan, meeting the high-end of its projections for the period. Baidu reported the strong earnings at a time when the company has been on a spending spree. Starting last year Baidu began pouring funds into marketing and research, cautioning investors that its future earnings would remain flat. But in the first quarter, the company's net profit was up, driven by the company's search business, said Baidu CEO Robin Li during an earnings call Friday. The company is increasingly attracting more users to its mobile search services. During the quarter, the company had 160 million daily active users from mobile search, up from 130 million users two quarters ago. Later this year, Baidu expects the company's mobile traffic will surpass its PC-based traffic, Li added. The company's research and promotional costs still remained high in the period. Research expenses were up 57.5 percent year-over-year. In addition, selling and administrative costs relating to promotional spending increased by 137 percent. Baidu is trying to squeeze more advertising revenue from its growing mobile business. Those efforts seem to be paying off. During the quarter, average revenue per online marketing customer grew 44.1 percent year-over-year. In total, the company has 446,000 online marketing clients. Nearly all of Baidu's revenue comes from its online advertising. The company recently introduced a feature that lets customers offer targeted ads for specific cities in China. For this year's second quarter, Baidu projected its revenue could grow by up to 60.2 percent year-on-year to 12.1 billion yuan.